Precisely on time on Dec. 24, 1968, Mission Control lost contact with Apollo 8 and its crew of Frank Borman, James A. Lovell, and William A. Anders. And everyone at NASA and onboard Apollo 8 was happy about that. It meant that the spacecraft and crew were on a precise trajectory to swing behind the Moon, and if all went well, to fire the Service Module’s Service Propulsion System (SPS) engine to slow their velocity just enough to allow the Moon’s gravitational field to capture them. With a successful Lunar Orbit Insertion (LOI) burn, they would become the first crewed spacecraft in lunar orbit, and Mission Control would regain the signal after 32 minutes and 37 seconds. If it didn’t fire at all, they would regain the signal in 22 minutes and it meant Apollo 8 was heading back to Earth. And of course, a variety of engine malfunctions could result in different signal reacquisition times. While NASA and the world awaited to hear from Apollo 8, Borman, Lovell, and Anders busied themselves with preparing for the engine burn. Just a few minutes before ignition, the crew got its first glimpse of the Moon. During the 66-hour coast to the Moon, the spacecraft was oriented with the SPS engine facing in the direction of travel, so the windows were pointed toward the Earth. Now, about 70 miles above its surface, the Moon finally entered into their field of view and the Apollo 8 crewmembers became the first humans to directly see the farside. Exactly on schedule, the SPS engine lit up and burned for just over four minutes, placing Apollo 8 into an elliptical 70-by-195-mile orbit around the Moon. Just as expected, Mission Control began receiving telemetry from Apollo 8 as it came out from behind the Moon, followed by Lovell’s simple call, “Houston, Apollo 8. Burn complete.” From Mission Control, Capcom Carr replied, “Apollo 8, this is Houston. Good to hear your voice.” As they passed over the Sea of Fertility, Lovell provided this commentary: “The Moon is essentially grey, no color; looks like plaster of Paris or sort of a grayish beach sand. We can see quite a bit of detail. … The craters are all rounded off. There’s quite a few of them, some of them are newer.” They also flew over the two most easterly of the five potential sites for the first Moon landing, providing verbal narration and taking photographs. For the next 20 hours, Apollo 8 remained in orbit around the Moon, each revolution taking about two hours, of which 45 minutes was spent out of radio contact with Earth while the spacecraft flew behind the Moon. The astronauts began their second revolution with a 12-minute TV broadcast showing the Moon as it appeared to them through the spacecraft window. At the end of the second revolution, once again behind the Moon, the crew preformed the second LOI burn using the SPS engine and lasting less than 10 seconds to circularize the orbit at 70 miles. The trio conducted extensive photography of the lunar surface, mostly of the farside given it had more sunlight, but also of proposed landing sites on the nearside. At the beginning of the fourth revolution, as they were about to round the backside of the Moon, the astronauts caught sight of the Earth appearing above the lunar limb. Anders snapped some of the most iconic photos of the Apollo program, first in black and white and then the more famous color Earthrise images. the Apollo 8 crew on Dec. 24, 1968. 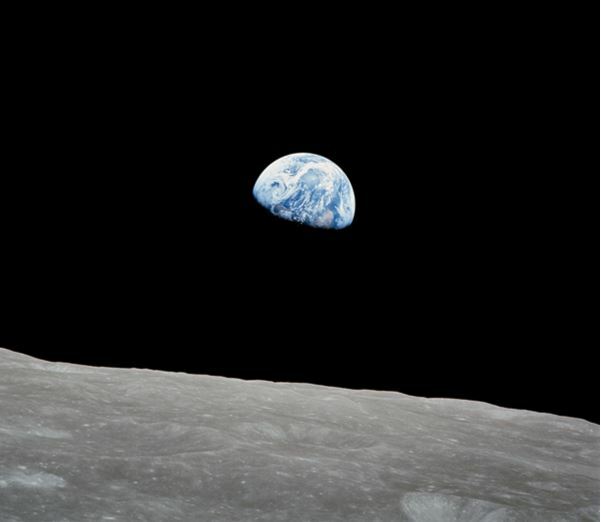 Borman, Lovell, and Anders began their ninth revolution with a TV broadcast, first showing viewers the Earth and then pointing the camera down to the Moon’s surface. As the spacecraft flew on, they described the terrain they were seeing, including the possible landing site for the first lunar landing in the Sea of Tranquility. Each crewmember provided the viewers with his personal impression of the Moon and the mission. They closed out the 27-minute broadcast by taking turns reading the first 10 verses from the Book of Genesis, and then signing off by wishing everyone on Earth a Merry Christmas. It is estimated that one billion people in 64 countries around the world were tuned in to the Christmas Eve broadcast. lunar orbit, which concluded with the reading from the Book of Genesis. At the end of their 10th revolution, at 89 hours and 19 minutes into the flight and once again out of communication with Earth, the Apollo 8 astronauts fired the spacecraft’s SPS engine for the Trans Earth Injection burn. While Mission Control waited for confirmation of the burn, the crew had its last look at the Moon’s farside. Then, precisely on schedule, contact was re-established indicating a successful 3-minute and 23-second burn. Apollo 8 was heading home to Earth. Lovell radioed to Houston, “Please be informed there is a Santa Claus.” It was now Christmas Day in Houston. To view Apollo 8’s Christmas Eve TV broadcast, click here.